May I ask.... what are these things on build sheet? Refrigerator bars are tension bars you can put in the frig to hold the food back from hitting the door while under tow. Sand pads are screwed onto the bottom of the foot of the stabilizers. Lego blocks or blocks of wood work too, but these are always there... nothing to stow, forget or lose. Step cover is just what it sounds like. Wraps around the outdoor step. Made out of recycled plastic and helps when wiping off your shoes! All these things are readily available at RV parts places. The sand pads - which are attached as Donna described - are larger foot pads used to spread out the load so that the stabilizer feet don't sink so far into soft surfaces (such as sand). 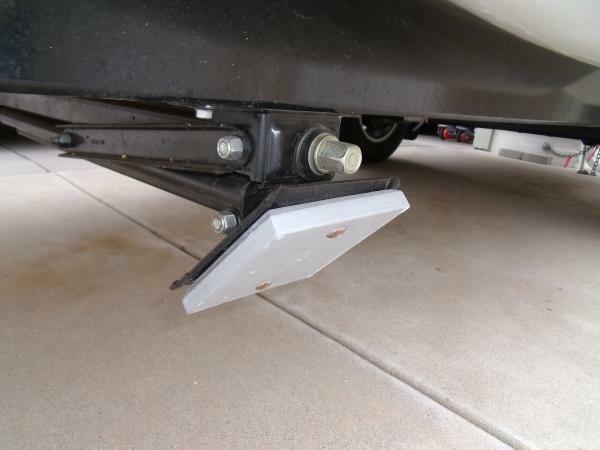 They are the "basepads" listed on Norco's BAL Accessories web page, in the version to go with the style of jacks on the trailer. does anyone happen to know if these are the same (or similar) to the Sand Pads ETI sells? Similar -the stabilizers on my 21 take the square version. If I remember right, the round ones are for a different BAL stabilizer. I remember Chuck had two different sand pads on his site. Let me see if I can find that information. I was correct. The round ones are for a different stabilizer leg. This image says Camco, but BAL also has this type. You need the square pad. Why not just order from ETI in Canadian funds? You won't have to install them, and they'll be the right model. Appears they cost $12.50 each or four for $50. I see the ones that Donna found are $12.89 each US. We have the square pads which were on our build sheet and we also often use blocks under them depending upon how far it is to the ground. I was really just more curious about *what* they were. Now I know... they look like a good idea.